Here’s a fitness training program for young athletes to take their fitness to the next level. Get ready for the sports season ahead and get in the best shape of your life with these Offseason Workouts Fitness. 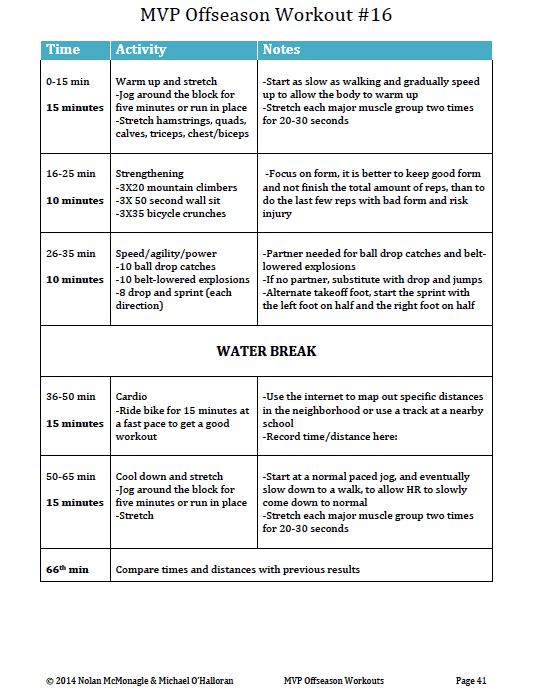 This training plan will help young athletes develop speed, agility, strength, acceleration and first step quickness. These skills are important in just about every sport. Step-by-step breakdown of activities for this fitness training program. Designed for either a 6-week time period with 3 sessions each week or a 9-week time period with 2 sessions each week. Kids participating in a sport during the sessions frequently find the 9-week time period works best. A fitness training program that gets you in shape. 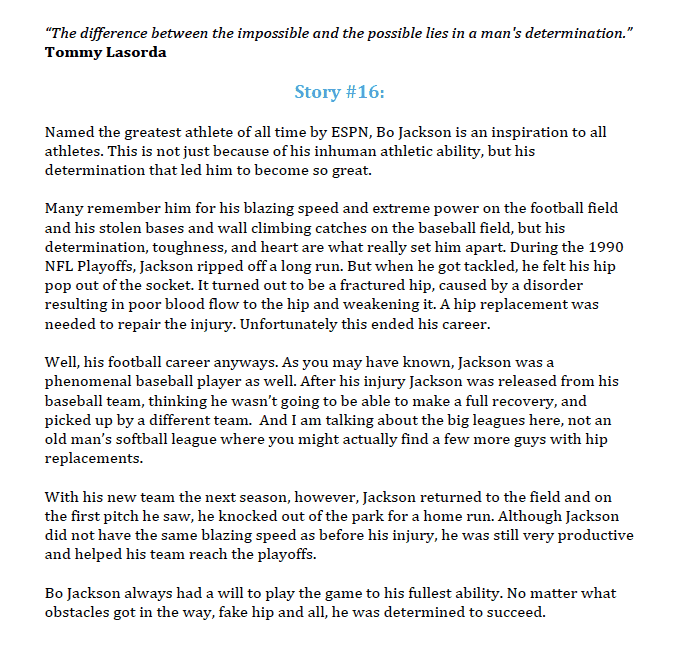 Each workout includes an inspirational story and quote. Life lessons like overcoming obstacles, treating people with respect and the power of having a positive attitude are reinforced. What type of players are these workout plans designed for? Ages 10 – 17 years old – both boys and girls. If the 66 minutes time period is too long or the activities are too challenging for younger players, we suggest shortening the sessions to 30 or 45 minutes in length. Pick and choose from the middle activities, while maintaining the warm-up and ending activities in order to reduce the time. Aerobic fitness. Aerobic fitness, or cardio, as it is often referred to, is the basic fitness that must be achieved to improve conditioning abilities. Exercise greater than two minutes is considered to be aerobic in nature, and therefore, includes almost all sporting activities. Strengthening. By performing basic, total body strengthening workouts, you can take your game to the next level. Being stronger does not simply mean being able to push people around, it also leads to increased speed and overall athleticism. Core strength and stability. Having six-pack abs does not mean you have a strong core. The core muscles include all muscles that stabilize the spine from the hip level up to the shoulder level. Exercises to improve core strength are tremendously important for athletes because the core is where power comes from. Footwork. To improve speed and agility, you must be efficient in your footwork. If you are wasting steps when changing direction, or while accelerating, you are losing speed and agility. Plyometrics. Plyometrics are a type of exercise that gives the muscles involved a specific action to improve that muscles ability to switch from an eccentric contraction to a concentric contraction. Essentially, it teaches your muscles to activate more quickly, increasing speed and power. Shift activities quickly. By moving from one activity to the next quickly, it keeps players interested and enables players to work on many different skill sets. Increase difficulty over time. Some of the fitness drills will get progressively more difficult. Initially, we want athletes to grow accustom to using different muscles and then as the plan progresses, we’ll ask for more repetitions or longer time periods. Feedback from results. By logging sets, reps, time, distance and other result tracking statistics, progression can be observed. Use these results to compare to earlier workouts and see your progression. Review previous results to try and beat previous times, distances, etc. Change exercises day to day. Rotating through different exercises between days keeps the routine fresh and keeps from getting bored. It also helps to avoid a “plateau” effect, where you stop improving because you are doing the same exercise day in and day out. Designed for an individual but can be used with a bigger group. One player on his or her own can complete the activities for these offseason workouts. However, workouts can be more fun with a workout partner or two. These plans will accommodate that. A whole team could workout together if there’s a big enough area and enough equipment. Plans were designed for healthy kids who have played sports before. If you have any concerns about having your child participate in this type of program from a health perspective, consult with your physician. Kids should bring a water bottle with them and drink water as needed. Why offseason workouts are important? Start the season in great shape. By starting the season in shape, you put yourself in a great position to focus on the sport, rather than trying to catch your breath all of the time. Improve speed, power and agility. During the offseason is when athletic ability is improved. Work on improving these components, and then use the regular season to apply them to sport specific activities. For example, basketball players should improve your first step explosion in the offseason, and then use that skill during the regular season to focus on exploding off the dribble. Your team’s coaches don’t have enough time to improve all components of fitness. Usually practices involve some conditioning and at higher levels players are either encouraged or required to do some weight training. But, there is not enough time for coaches to work on improving each player’s speed, power, agility and overall strength. Use the offseason to help the coach, as well as yourself, and come to practice with improved abilities. Repetition. In the offseason, you have all the time you want to improve. This means, if you notice something is going wrong, you have the time to work on it. You can slow it down to ensure you are doing it properly, and then take as many repetitions as you please to perfect it. This is especially important for the footwork during activities; if your footwork is off, slow it down and perfect it, and then work up to full speed. You cannot be expected to do everything perfect on the first try, but with more repetitions, the better you will become. Decrease risk of injury. The better shape you are in, and the more safe, strain your muscles, tendons, and ligaments have had on them, the better the body is prepared to keep from injury. It’s a relaxed environment where no one is watching. Individual workouts enable players to take lots of risk with no fear of evaluation or criticism. Sometimes, it’s by taking chances and some risks, that players really improve their abilities. Nolan McMonagle With a bachelor’s degree in Exercise Science from Central Washington University, Nolan has worked alongside a Physical Therapist with a professional indoor football team. In addition to helping treat players’ injuries, he put them through exercise programs to enhance their performance on the field. 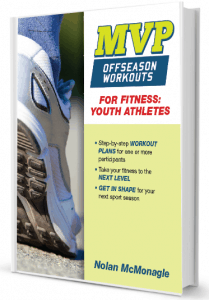 A basketball coach and author, he also co-wrote MVP Offseason Workouts for Youth Basketball. SAMPLE PLAN from this fitness training program includes inspirational story and agenda with explanation for activities. Note: sized to 8.5″ x 11″ for convenient printing. Appendix items for this fitness training program provide additional detail for the workouts.